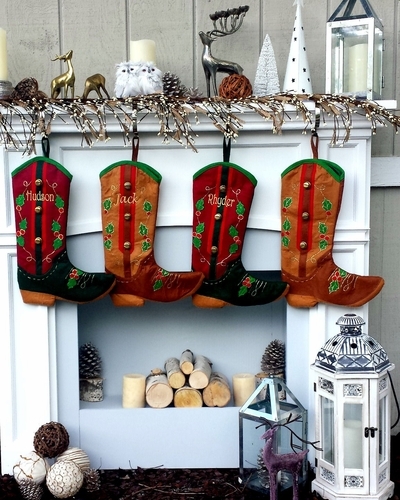 Country Western Boot Christmas Stockings with applique and jingle bells. SOLD OUT FOR THE SEASON ON 11-17 - we will have more next year. The embroidery lettering on this stocking has to be made a little smaller because we have a limited space on the boot. Measurements: The stocking is plenty big, about 17" diagonally and 6 1/2" wide. Materials: The stocking is made from felt. Names can be personalized on the body of this Christmas stocking with GOLD, Green, SILVER or WHITE metallic embroidery thread to compliment the design of this Christmas stocking. We also have a complimenting brown cowboy boot stocking so you can make a set for the whole family or ranch!